At Make School, we see the admissions process more as a coaching opportunity rather than a process during which we simply judge students on their skills and experiences. Our mission at Make School is to ensure that every student gains the abilities needed to succeed in reaching their goals and aspirations in life - and this mission starts during the admissions process. The selection process takes a holistic view of your experiences and achievements - both inside and outside of the classroom. A pattern of hard work. This could be in an academic or non-academic setting. Involvement in projects, activities, organizations. This could be a hackathon, volunteer work, student council, community projects, sport teams, or academic societies. Character traits such as teamwork, collaboration, kindness, emotional intelligence, resilience, and an interest in software engineering. While we value prior programming experience, we do not require it. In fact, our admissions process was designed to welcome programmers of all levels. The first step is to complete the online application. There is no fee to submit an application. While the selection process is not focused on GPAs and test scores, you will need to submit official transcripts and you may need to submit test scores. An application is only considered complete once official documents have been received. Official high school transcripts if you are currently completing high school, or you have graduated and have less than 24 college-level transfer credits. Official college and university transcripts for all institutions where coursework has been taken. Official ACT or SAT Test scores if you are currently completing high school, or you have graduated and have less than 24 college-level transfer credits, unless it's been more than two years since you finished high school (graduated in 2016 or before). Please have your counselor or registrar submit your official transcripts digitally through SPEEDE. Make School's code is 7957. Note, if you are currently enrolled at a college or university, an unofficial transcript sent to admissions@makeschool.com is accepted for admissions purposes. As soon as the in-progress term is over and grades are posted, you will need to send your official transcripts. Click here to share these instructions with your counselor. Alternatively, if you are submitting official high school transcripts, you can ask your counselor to include your test scores on the transcript. See useful information on reporting scores, upcoming test dates, and how to get a fee waiver here. Instructions for submitting transcripts and test scores will also be available on your dashboard after you submit the online application. After submitting your application you may be contacted by an admissions officer for an interview. The interview will be requested over email. Once you have completed all the steps in the applicant checklist, we will make a final assessment. You will be notified via email of the decision, and if admitted, your dashboard will be updated with the steps to enroll. See the "Important Dates" section below for more information on when you can expect an admission decision. Ramp is a free, online program designed to prepare you for success at Make School. Depending on your existing level of programming experience, you will be able to jump into the content at the starting point that is right for you. Practice the fundamentals - variables and objects, arrays, loops, conditionals, functions, and classes - by completing programming challenges that increase in complexity as you build up your coding skills. Once you are comfortable with the basics, you'll take on a larger project - building a portfolio-worthy project from scratch using object-oriented programming. Prepare for success at Make School by further leveling up both your technical and professional skills before you arrive. We want to ensure that all prospective students have enough experience with programming to confidently commit to majoring in computer science given that we do not currently offer other degree programs. 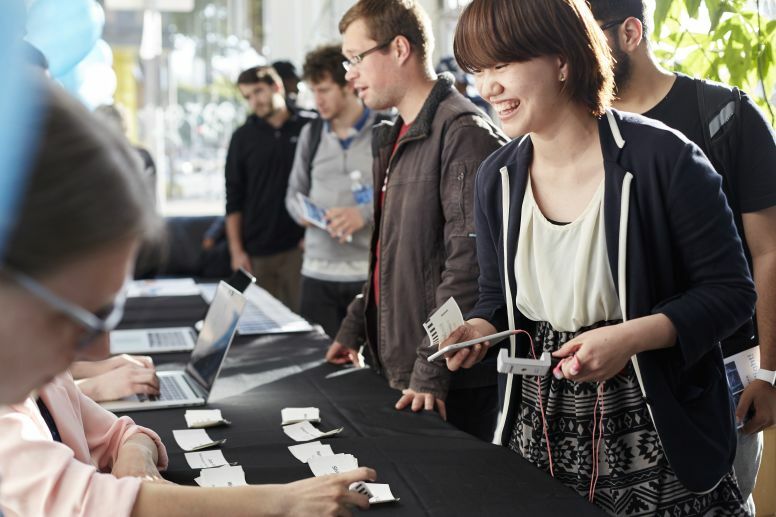 Each year Make School welcomes exceptional transfer students from institutions around the country who are looking to dive deep into the practical study of computer science. We appreciate the ways in which transfer students add to the fabric of diverse backgrounds at Make School with their unique perspectives. Learn how to transfer to Make School. The F-1 visa is the only visa that non-US citizens or permanent residents can use to attend Make School. Make School will be eligible to accept international students once final accreditor approval is obtained and once the federal government adds the program to the list of F-1 visa eligible programs. In previous years, the federal government update would usually take weeks. Under the current administration, there may be additional delays. Furthermore, Make School is in the process of finalizing tuition financing options for international students. Though we hope to offer tuition financing that makes the program accessible to international students, international students should be prepared to cover their cost of living during the program - housing, food, and other expenses may total up to $20,000/year. As a result, though Make School is accepting international applicants, we strongly encourage applicants to apply to other programs to keep other options open. Make School expects to be able to update applicants on whether the program will be F-1 eligible by April 2019.